Several years ago, on a visit to Mount Usher gardens, Wicklow, I saw a shrub with pretty white flowers that I just coundn’t place. I wracked my brain again and again and I just could not work out what it was. Every time I looked at the photos they seemed to taunt me and unfortunately the idea that it was in Elaeocarpaceae was so entrenched in my mind that I couldn’t get past it. So when I had a reason to contact Sean Heffernan, the Head Gardener, I asked him if he knew what it was. I am glad to say that no longer is this photo a NOID (No ID – meaning unknown) but is revealed to be Anopterus glandulosus – no, I had not heard of it either! 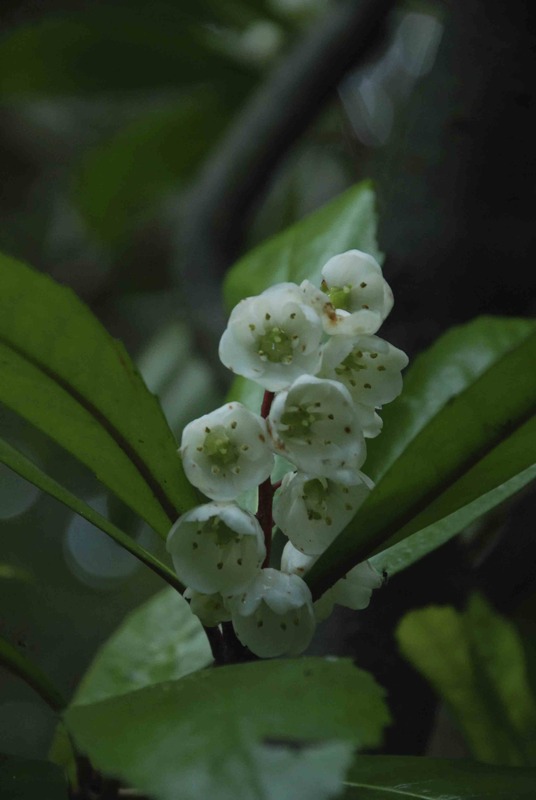 It is a native of Tasmania, found in forests, mostly in the west and south of the island where it is called native laurel or Tasmanian laurel. It is a nice foliage plant with relatively large, (15cm) glossy leaves. It flowers in late spring and again in autumn with pretty, white, sometimes pink-tinged flowers. These are scented but I did not notice that. It is reputedly easy to grow but is not incredibly frost-hardy and needs a sheltered spot with partial shade. There are just two Anopterus species, the other from New South Wales and Queensland and it is closely related to Escallonia – it seems obvious now! So it is in Escalloniaceae not Elaeocarpaceae – at least the first letter was right! It needs a rich, freely draining soil, ideally rich in organic matter. It withstands light pruning. It is difficult to propagate by cuttings but can be grown from seed. The name comes from the shape of the seeds – ano meaning upwards and pteron meaning wing – because of upward facing wings on the seeds – though surely that must depend on what way up they are!